Subject categories allow you to organize your guides, databases, blog posts, and e-reserves courses. This can make it much easier for your patrons to find content in LibGuides related to a particular subject area. You can even assign specific users as experts in a particular subject, letting patrons know who they can contact if they need research help. View guides by subject on the homepage. When you assign your guides to subject categories, your patrons gain the ability to browse guides by subject on your LibGuides homepage. When patrons click on a subject, the list will expand to show all of the related guides and a link to the subject's homepage with more related content. Subject homepages. Each subject you create has its own homepage, which includes all of the assigned guides, databases, blog posts, and e-reserves courses. It will also list all of the librarians assigned as experts to that subject, making it a one-stop shop for all resources on a particular subject. Filter the A-Z Database List by subject. When you assign your databases to subject categories, your patrons can filter your A-Z Database List by subject to easily find related databases for their topic. You can even designate some databases as best bets, which highlight the top resources for a particular subject. View blog posts by subject. When you assign your blog posts to subjects, your patrons can filter your blog by category to read related posts. View e-reserves courses by subject. If you subscribe to the e-reserves module, you can also assign your courses to subject categories. This adds one more way that your patrons can locate the e-reserves content for their courses. Subjects and widgets. When creating Guides and A-Z List widgets, you can filter them by one or more subjects to create a customized list of guides or databases. There is even a Subjects widget that allows you to create a list of links to your subject homepages. Subjects and the LibApps LTI tool. Subjects also play a role in the LibApps Automagic LTI tool. If the metadata for your course matches the metadata for one of your subjects, the Library LTI page can display a link to related databases as well as the experts for that subject. To manage your subject categories, go to Admin > Metadata & URLs > Subjects. Only admin-level users can create and manage subject categories. Guide owners can then assign these subjects to their guides. Click on the Add Subject button. Under the General tab, enter the name of your subject in the Subject Name field. If you'd like, you can assign a friendly URL to your subject's homepage in the Friendly URL field. This can make it easier to link to your subject homepage. 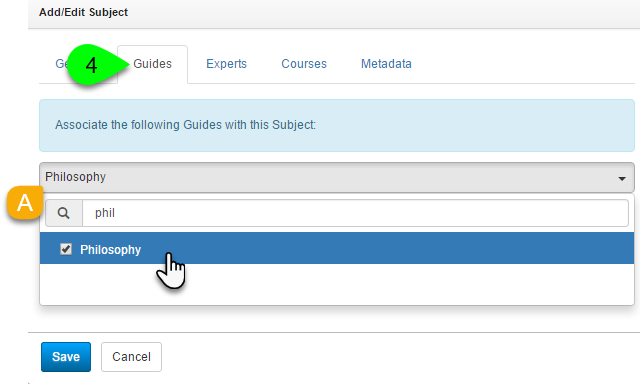 If you'd like to assign guides to your subject now, click on the Guides tab. From the dropdown menu, select each guide you want to assign to the subject. If you'd like to assign experts to your subject now, click on the Experts tab. From the dropdown menu, select each expert you want to assign to the subject. If you have the e-reserves module and want to assign courses to your subject now, click on the Courses tab. 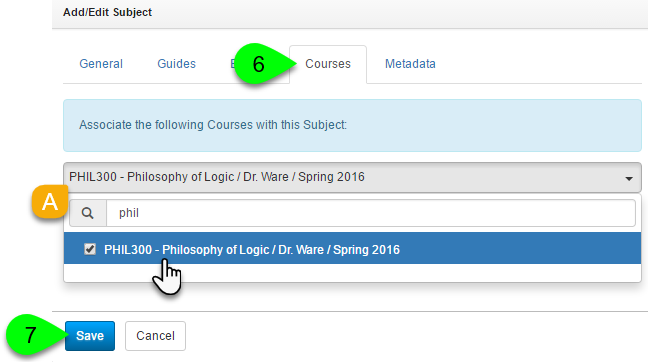 From the dropdown menu, select each course you want to assign to the subject. To delete a subject category, click on its Delete () icon in the Actions column. This will delete the subject, but not any of the guides, databases, courses, users, or metadata assigned to it.